Hard Cover Press Books are made with magazine style press papers and perfect bound at the spine. Wrap with one of our many colorful cover options, and you have a custom-made coffee table book! 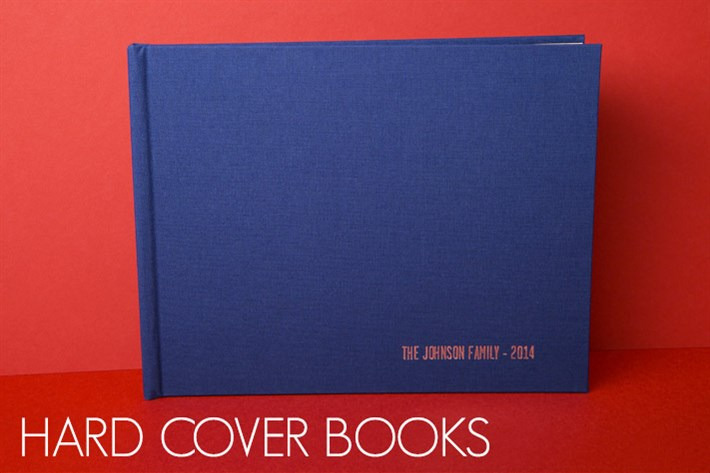 Custom Image - Customize the cover of your Hard Cover Book with one of your images. The design will be printed on one of four substrates and wrapped around the album from front to back. If selecting canvas, your image is printed on canvas substrate and a coat of lamination is added for protection. Glossy covers are printed on photographic paper with a coat of high gloss applied. Our Fuji Pearl option is printed on Fuji Pearl photographic paper with high gloss. Satin Covers are made of E-Surface photographic paper with a coat of matte lamination on top. Eurohyde Leathers - Choose from a variety of colorful Eurohyde options, wrapping around the book. Eurohydes are included in the price of the Hard Cover Book. Art Cloth - Wrap your book in one of our many Art Cloth covers. Art Cloth is included in the price of the Hard Cover Book. Window Covers - Use an image to display on the cover of your Hard Cover Press Book. Four options are available for windowed covers – black Eurohyde, brown Eurohyde, blue Art Cloth and black Art Cloth. Fuji Pearl Dust Jacket Cover - Printed on Fuji Pearl photographic paper, Fuji Pearl Dust Jackets wrap around the cover for added protection. Each jacket can be custom designed. Add linen texture to your jacket for a rich, but subtle look. Cover Stamping - Add cover stamping in gold or silver to standard leathers only with the exception of Brown Velvet. Choose from Alana Pro or Garage Gothic font. Up to three lines of text can be stamped on the cover (28 characters per line) in the lower center or lower right corner of the album cover.